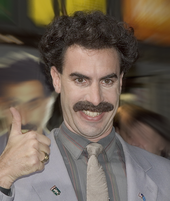 ↑ Sacha Baron Cohen: Our man from Kazakhstan. The Observer. 10 September 2006. ↑ Scott, Kirsty (২৯ সেপ্টেম্বর ২০০৬)। "He becomes the character, certainly with Ali G and Borat. He has a mix of Sellers's acting and Rod Hull's bottle"। The Guardian। Features। UK। সংগ্রহের তারিখ ১৬ জানুয়ারি ২০০৭। First acted with the Habonim Dror Jewish youth group and at Cambridge in plays such as Cyrano de Bergerac and Fiddler on the Roof.